I am naturally an extrovert. But letting people in, get close, is not easy. My tendency is to put up walls, go it alone. I was mercilessly teased in elementary school, and middle school. I was awkward and didn't know where to fit in. And then a red-headed girl with cutoff jeans sat across from me. Stared with an intensity that bordered uncomfortable. And said, Jesus loves you. Fast forward ten plus years of God speaking truth to me through this friend. I found myself in adulthood, blogging, and still not really building community. What does it look like? How does it start? Why am I still so awkward? That same red-headed friend, still rocking her cut off jean shorts said, "Hey have you read this blog? Heard about this conference? Let's go!" And so we did. We drove from the East Coast to Indiana. We arrived, excited, maybe already exhausted, but definitely ready to soak it all in. And we did. The extrovert in me had a million mini conversations and I left thinking all the thoughts. It was an incredible experience. I knew I wanted to do it again. But did I make friends? Why did I talk to so many people instead of having great conversations with a few people? Would anyone actually remember me? The weeks and months that followed the first Influence Conference were a huge learning experience for me. I saw an amazing community of women. Women who cared about one another, poured into one another. Who truly believed in community because that is how Christ calls us to live -- in fellowship. Community is a two way street paved with grace and prayer. You pray for one another, you offer grace, you are prayed for, you receive grace. With that comes encouragement, truth, and the deepening of relationships. Its less about making friends, more about loving God's people. In the last two years, my focus and attention towards community have radically changed. I want to meet you. I want to encourage you. I want to hold your cheeks in my hands, look you square in the eyes and say, Jesus loves you, just as you are. You are enough. And I am glad you are here. A group of us are serving as Community Leaders for the 2014 Influence Conference. We are here today because we want to share our stories. But we also want to hear from you. 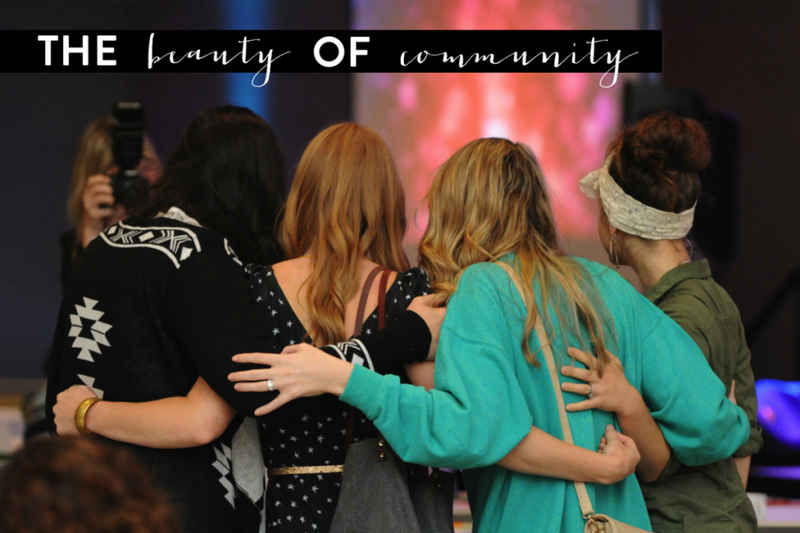 Share your story of community on your blog and come back to link up here. And if you don’t have a blog, we want you to come back, read, and be encouraged. I have always felt a little awkward too! And even still I do... but I determined this year that I was going to stop letting feelings of awkwardness and self-doubt get in the way of great community, so I'm working on it. Thank you for your encouraging words! Wow, what an awesome friend you have, that's incredible that she loved you so well! I love what you said, that community is paved with grace and prayer. I need to pour out more of both of those things in my relationships.